Train My Dino - Wild or Mild! 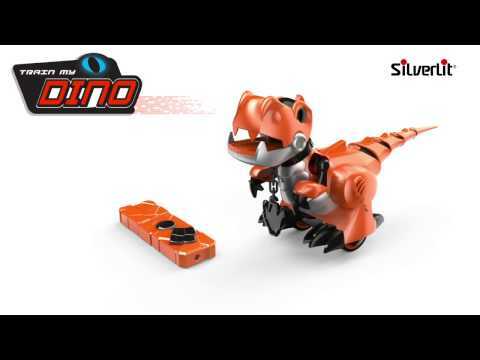 Remote control T-Rex with fun sound effects who can be put into interactive Training mode. In Wild mode, he randomly chases around and roars, avoiding obstacles with his intelligent sensors. For a milder Dino, pop on his collar to change to Training mode and control him with the easy to use four directional remote. Pat his head and he will faithfully follow you round, obeying your hand movements and even performing tricks. Play with your own prehistoric pet - call him Rex? Your very own pet dinosaur! Fun 48 piece 3D puzzle of two dinosaurs posing for a selfie! Fun fast memory game that tests your Dinosaur knowledge. Doodle & colour in, then wash & start again - Dino creativity! Amazing Balancing Pteranodon - Defy Gravity! Looks impossible but easy to balance almost anywhere - magic! Wicked Uncle is rated 99 out of 100 for Customer Service based upon 23125 reviews.